The Chapel was built in 1829 as a Wesleyan Methodist Church on land purchased from the Furness family for £15. Electricity was installed in 1931 and it was the first building in the village to have electricity. The bell tower and a vestry were added later and further altered in 1946. The ruins of two cottages next door were bought and made into a garden now known as Chapel Gardens. Among the pleasures of writing a book of this nature are the unexpected directions you find yourself pursuing as information unfolds for you. One example of this is the steep learning curve I followed in coming to appreciate the extent of the part played by the Wesleyan Reform Church in the history of both Derbyshire in general and Stoney Middleton in particular. With regard to the former that is an account to be written by others but where Stoney Middleton is concerned we are fortunate indeed that Tom Carter was a preacher at the Chapel and devoted a substantial part of his life to serving the institution. Indeed he recalls reciting for an examination more than 74 years ago at the Chapel Sunday School. From Cobbler’s Patches it is abundantly clear that, although it’s influence has clearly waxed and waned, there have been times when the Chapel has been at the heart of village life, made a key contribution to the development of Stoney Middleton and engaged the attention and commitment of numerous village residents. If you should wish to visit the village chapel of Stoney Middleton you would turn off the main A623 opposite the Moon Inn, make your way down the Nook past the small bridge at the bottom and then turn off sharply left up the hill until you come to a fork in the road. Taking the left fork takes you into Cliff Bottom and the chapel is more or less immediately on your right. It was built in 1827,is a Grade Two listed building, and was originally Methodist before becoming Wesleyan Reform. The ground on which it was built was purchased from the Furness family in High Wycombe for the sum of £15.00 and Tom Carter refers to the first chapel deed as dating from 1829. In those days which particular religious denomination you followed could have consequences and Thomas Cowan, writing in 1910,makes a brief reference to Weslayans suffering a degree of harassment in the past. Tom Carter is able to shed further light on this, himself acquiring information from a preacher named Benjamin Cooper who had lived in the period of the split in 1848-49 when the Wesleyan Reform Church had a painful birth. This is not the place for a full-blown history lesson but many readers will already be aware the Wesleyan Church was itself a break-away from conventional Anglicanism. The Wesleyan Reform Church was a break-away from Wesleyanism itself and the schism did at the time produce serious disputations and a great deal of animosity between reformers and their opponents. So much so in Stoney Middleton that Mr Cooper and other reformers felt it needful to stay all night in the Chapel building to prevent it’s seizure by the Wesleyan authorities. 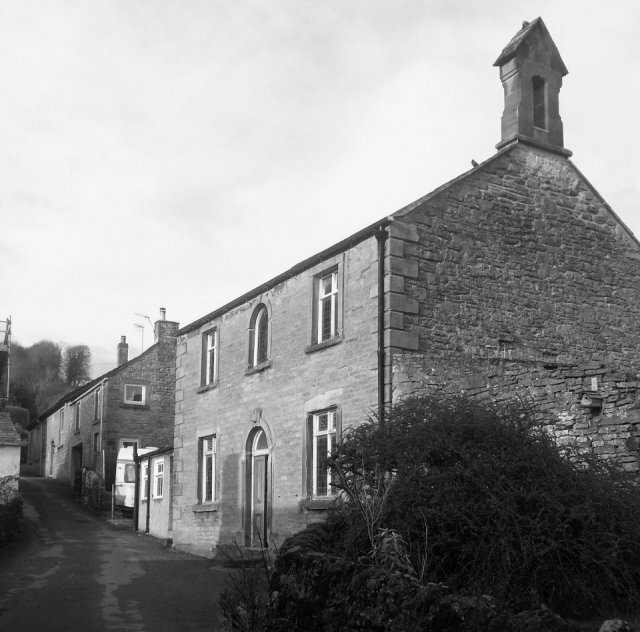 Fortunately matters had settled down considerably by Tom’s day and he recalls a very significant moment in 1946 when a Methodist Circuit Minister and Steward visited the village and handed back the original 1829 Chapel deeds. Overall though the history of the Stoney Middleton Chapel is very much one of survival and recovery. By the late 1800s there was apparently only one regular member, a lady who both keeping the establishment going and attended alone the Sunday Services delivered by whichever local preacher she had invited from the other churches on the circuit. Nevertheless the congregation clearly recovered sufficiently for Florrie Carter (who we have already encountered earlier) to go off to Africa as the first Wesleyan Reform Missionary to visit those shores. Certainly in 1926 things were healthy enough for the Chapel to purchase the ruins of two small cottages next door for a figure of £80 and convert these to a small garden; the restyling of this in 1995 resulted in the discovery of a large number of items of stone and pottery. Tom Carter tells us that this site also belonged to the Furness family in High Wycombe and that the purchase involved some hard bargaining although the chapel was eventually given the piece of land on which it’s current vestry stands today. The village once again demonstrated a spirit of community at this time by donating a seat and a plethora of plants for the new garden. The garden itself is still very much in evidence and is a very pleasant and relaxing place to leave the world behind for an hour or two. 1931 saw the chapel become the first building in the village to receive electricity-the annual cost being an extortionate £4.00 apparently. At first this amounted to lighting only with heating following several years later.-increasing the cost to £13.00. The installation being carried out by Messrs Needham of Bakewell. According to Tom Carter the decision to proceed took several meetings and a visit to Monsal Head Church which already had the facility. In 1946 a new vestry, built by a gentleman named Lincoln Mason, was added to replace the existing one at a cost of £100 and this, together with the rest of the building survived what is generally regarded as the worst winter in living memory in 1947. According to Tom Carter the roof became thoroughly covered in snow but the angle of the roof prevented the snow from falling off. Several snow falls occurred and then froze until it was a yard thick at the top end. A slight thaw then caused the snow to move en bloc until it was about 18 inches over the edge, creating a danger that ,were it to fall, it could easily have gone completely across the road and demolished the wall opposite. All that could be done was to cut off any overhanging edge and to continue to do this day after day. Attacking the snow with a stirrup pump and buckets of hot water made no impact at all and in the end only a complete natural thaw dealt with the problem. The roof, nonetheless, survived all of this entirely intact. As for what took place within the chapel we are again enormously indebted to Tom Carter for a treasure trove of information concerning the vibrant part that the chapel has clearly played in village life at times in its history up to and including the present day. There may have been downs in attendance but Cobbler’s Patches leaves no doubt that there were plenty of ups as well. As we have seen Tom himself was a Chapel Preacher and as such was part of a team of preachers who formed a Circuit covering Stanton Lees, Foolow, Youlgreave, Birchover, Brassington, Elton, Over Haddon, Bakewell, Bonsall, Stone Edge, Curbar, Frogatt, Grindleford, Eyam, Calver and, of course, Stoney Middleton. The organization of the Wesleyan Reform Circuits were, and very much still are, organized around what is known as the Plan. I have attached a copy of the 2014 Bakewell Circuit Plan and it will be clear that this is a complex document setting out not only which preachers are due at which venues on what days but also the names as to the holders of key posts of responsibility within the Circuit and similar information. Alert observers will note that the current Circuit President is a Stoney Middleton resident, as was Tom Carter of course when he held the post in 1941. To be a preacher on the Circuit is an honour and a responsibility with prospective candidates required to pass an examination to demonstrate their faith, biblical knowledge, commitment and ability to communicate. Tom provides us with a wealth of information about the individual preachers and I would heartily recommend the reading of Cobbler’s Patches in full for anyone wanting to know more in this area-indeed I would heartily recommend reading the entire book anyway. This publication can only offer a few highlights concerning what was clearly a remarkable set of individuals. George Henry Wilson-Tom Carter’s best friend and described by Tom as a dynamic preacher with a great capacity for thinking on his feet who could change the atmosphere of a meeting when he spoke. George claimed to have committed his life to God in Middleton Lane one morning after attending Sunday School. On his death he left the then very substantial sum of £300 of which £60 went to each of his four children and the final £60 towards the cost of the chapel roof-money well spent as we have seen. Tom proudly gave the address at George’s funeral which was so well attended that the Chapel could not accommodate all the mourners. Sammy Sellars-Tom tells us that Sammy had no book learning but preached in the vernacular. He apparently came to the chapel as something of a repentant sinner having once alarmed a crowd at Eyam Wakes by falling out of a Swingboat whilst severely intoxicated. Always retaining a penchant for plain speaking when told by a congregation member that – I don’t agree with what you’ve been saying tonight Mr.Sellers, replied – Well I did,nt ax thee did ah? James Cook-actually from Over Haddon-and who distinguished himself one night when attacked by two ruffians. Mr Cook immediately dropped to his knees and loudly implored the Lord for assistance-sufficiently frightening his attackers that they ran off swearing never to do anything of such a nature ever again. Edwin Gregory –who was in the habit of carving scriptural texts in the roadside above Curbar village and who eventually became something of a celebrity with his writings appearing in magazines and periodicals. Maintaining the glorious Stoney Middleton multi-taking tradition he was also a professional mole-catcher. A Miss Wheeler who taught at Lady Manners school and was a Church Militant. For those ignorant of such matters I gather that, whilst most Christians content themselves with seeking to avoid sin, a Church Militant considers themselves to be part of a militia dedicated to actively opposing it in all of its forms. The Chapel also had a few famous visitors with a British General, General Waller calling in on one occasion and also a visit from the previously mentioned Lord Denman who paid a visit and praised the efforts of a young preacher called Edwin Wright. In Tom’s time the Chapel had its own choir, varying in size depending on attendance levels, and assisted by a device called a pitch-finder which apparently was a box-like flute affair approximately nine inches in length and very useful for starting tunes if no organist was present. In fact, however, as often as not the Chapel was well-served by organists-Tom mentions several in Cobbler’s Patches–and in fact undertook the task himself for a time. Until 1939 Chapel organists played on a harmonium when this was replaced by another instrument which had imitation pipes and was presented to Stoney Middleton Chapel by the Ashford Methodist Church. This lasted until the 1980s when the current instrument arrived. Cliff College (see below) also contributed organists including a Mr Henry Edward Pascal Purcell who was a direct descendant of the renowned Henry Purcell who was the organist at Westminster Abbey for some years. The Chapel also had a Sunday School in which Tom taught for a time and which reached a register of over 70 scholars in its heyday. Another local teacher in the school was a Jonathan Hallam who shared his talents between church to chapel. Jonathan had to overcome deafness to do his teaching and once became so enraged by one pupil that he dragged him out of the school by his ears. By 1956 when Tom was writing Cobbler’s Patches numbers had declined but a Brother Rooke (providentially sent to the village during the Second World War according to Tom) was carrying on as the School Superintendant. The Sunday School also had a regular annual event called an Anniversary. This was conducted initially by Edwin Wright of Stanton (the same person who so impressed Lord Denman presumably) and then by his son Charlie. Since then the Anniversary service has been conducted by a different preacher every year. Finally in looking at the past history of the Chapel I do not think that Tom Carter’s spirit would forgive me if I did not mention its connection with Cliff College. In the main text we have referred to Florrie Carter who married John Skerrit from the College but Tom makes it clear that the connection with this local place of Christian education went much deeper. In Tom’s time Cliff Students were sent to the Chapel to assist on a 2 x2 basis. Well remembered duos were Silk and Beeson, Laff and Adamson, Chenery and Cheeseman, Loveridge and Owens and most famous of all Harris and Attwood. To a modern reader the term Harris-Attwood Revival probably means nothing but Mr John Harris and Mr George Attwood went on to form a Mission which obtained sixty conversions. They were also instrumental in making the Christian Endeavour Society active in Stoney Middleton. This organization was actively involved in developing Christian education amongst young people and apparently started life in 1881 with six students sitting in the living room of a preacher in Maine, America. From these humble beginnings it spread rapidly and its first establishment in England was in Crewe in 1887 with the involvement of Messrs Harris and Attwood bringing about an enthusiastic membership in Stoney Middleton, Curbar, Calver and Eyam around the turn of the century. The overriding idea was to train young people for public speaking and the general spreading of the Word of God. Tom was an enthusiastic member, honing his speaking skills and producing a number of papers and leaflets. John Harris meanwhile moved on firstly to start a mission in the Congo and then founded the Congo Reform Association which achieved fame by exposing the so-called Rubber Atrocities. He then returned to England, became an MP , found himself sent by the government to investigate trouble about Chinese labour and was then despatched around the world by the Society of Friends to look into conditions of native labour. Other than this he seems to have led a fairly boring life! Amongst the other names mentioned above John Luff died on the first missionary steamer on the Congo River, Mr Cheeseman died in China during the Boxer Rising, Mr Chenery lost his life crossing a Chinese river and Mr Loveridge spent twenty years in Panama. Incidentally the Christian Endeavour Society still flourishes today and has its own website, which is where I found the background information quoted. On a lighter note local resident Gladys Barker ,quoted more extensively elsewhere, has her own recollections of Cliff College representatives. It appears that one Sunday Gladys and her friends had arranged to meet some lads at the village cross in Stoney Middleton. Arriving early they found a Cliff College contingent already in attendance and enthusiastically engaging residents with preaching and hymn singing. Gladys and company had hymn books thrust into their hands and were singing away merrily when their young men arrived, finding the spectacle hilarious. Moving to the present day from the information provided to me by Beth Ely it would seem that the pattern of relative decline and recovery has been repeated more recently. Beth became involved with the chapel after moving to the village in 1991 and is now a Lay Minister and very actively engaged with the running and up-keep of the establishment. She can also recall a congregation down as low as three people on Sundays at one time but which has again now revived to a much healthier state with regular Sunday morning worship still lead by Circuit preachers. What may have helped this process of recovery oddly is the discovery of woodworm in the pews that were then the chapel’s main furniture. In order to deal with the problem it was necessary to gut the building, replacing the old Vestry door with a new one and the pews with tables and chairs. Conceivably this rather more relaxed informal appearance may have suited modern sensibilities more. This combined with the introduction of monthly coffee mornings, the presentation of an exhibition at every annual Well Dressing and a variety of other initiatives, has meant that the chapel is now very much a going concern. One of the initiatives which is a particular source of pride to Beth was a form of exhibition simply titled Talents in which people were encouraged to produce creative work in whatever field they felt they had talent. The result was a remarkable illustration of just how many individuals hide their light under a bushel with a wide variety of artistic creations produced including a delightful example of detailed exquisite crochet work. From my own point of view in the process of producing this book I had the pleasure of sitting in on one of the coffee mornings with a view to recording the recollections of a number of the older village residents. What was interesting to note was that, on a very cold January morning a couple of young mothers brought their children in for a cup of coffee and a chat. Undertaking electronic recording with children in the room does have its challenges but it is surely a good thing for the village to maintain these social contacts. Finally on the Chapel I have included verbatim the following gem from SMILE’s 2002 booklet Stoney Middleton: A Working Village. It is entitled A Grandmother’s Tale and gives one resident’s account of attending Sunday School regularly at the Chapel in Stoney Middleton. I am indebted to SMILE for permission to reproduce a delightful piece of local history from the perspective of one individual. I have very happy memories of my time as a Sunday School pupil. There were large numbers of us and we were divided into classes according to age. At anniversary and Sermons time we all diligently learnt our lines, which always had a biblical theme. At these times a step like stage was erected beside the pulpit, older children on the bottom row going down in age to youngsters on the top row where I started off. There was also a full choir which sounded magnificent. Harvest Festival was a lovely time we all looked forward to decorating the chapel when the stage was again set up and filled with produce –everything had to be perfect. The scent that met us on Sunday morning was lovely from all the flowers and vegetables plus sheaves of corn-now a thing of the past since the advent of the combined harvester. There was always a glass of water, piece of coal and a loaf of bread. The pulpit was adorned with black juicy grapes grown by Mr Carter, the Sunday School Superintendent. Children brought up on rationing in the war and after looked upon these with wonder. We were lucky to see grapes. There were also boughs of rosy red Siberian crab apples, which were very sweet to eat. Mr Rooke took over as Sunday School Superintendent in 1954. He had been a member of the chapel since 1946 and a local preacher since 1947 giving long and loyal service. Each summer we children all looked forward to the Chapel Trip-all scholars went free-to the seaside on Teddy White’s bus to Colwyn Bay, Scarborough, Skegness, Rhyl to name but a few. At the end of the day we all returned home tired but happy after a day spent paddling our toes in the sea and eating ice cream cornets. The Christmas Party was held in the Reading Room and an enjoyable time was had by all. At the end was prize giving when scholars were presented with a much treasured book. The dates mentioned in this extract clearly place the events described in the immediate post-war period and, whilst we have seen that the Chapel is still going strong, it is difficult to imagine we will ever see this degree of idyllic innocence ever again. A friend of mine, Mrs Esme Brimblecombe who lives in Devon,has asked me to post this email because of no access to a PC. Her Grandfather was the late George Henry Wilson. She has told me many stories of her childhood at Stoney Middelton . She said that her Grandfather preached at the Chapel and after his death a Chair and table was made and presented to the chapel in his memory, and wondered if it is still there? She has also asked, where could she get a copy of the book ( Cobbler’s Patches ) written by Tom Carter. I hope you can help. Regards Esme Brimblecombe Nee Wilson. We are delighted to say that the chair and table are indeed still in the chapel. The book is being tracked down when we hope to copy it and provide it on the website. Dear Mr. Lee, I am just realising, months on, that I can answer this query, sort of, for Mrs. Brimblecombe. The only copy of which I have heard tell that may exist of Mr. Tom Carter’s “Cobbler’s Patches” remains in typescript unbound format in the possession of one of his granddaughters. I’ve inquired about the possibility of viewing this wonderful work (I’ve seen a few photocopied pages of it–from the bit I’ve seen,it’s a real trove of information–historical and genealogical), but I believe that the family may prefer to keep it private at this time. Best wishes, Glenn T.
George h Carter was brother of Dorothy Carter ( my g g grandmother) who married William Marshall. Unfortunately she died quite young . (you’re my distant cousin twice over!–Dorothy Carter descends from my many-greats-uncle Jonathan Hallam 1666/7-1708, and her husband William Marshall descends from Jonathan’s sister Mary Hallam Fletcher (I’m a descendant of Jonathan and Mary’s brother “Old Joseph” Hallam 1673-1739/40)). Yes, Florence Carter 1875-1906 died on missionary work in the Congo and is commemorated in a headstone at Stoney Middleton. She and her husband the Rev John Skerritt don’t appear to have had children. I haven’t been able to find out what happened to John–I think he may have eventually died abroad as well. Florence, yes, was the eldest child of George Henry Carter 1846-1918 and of Mary Ada Fletcher 1856-1929. Her next brother was the Tom Carter mentioned above in the above Jan’ry 2016 post by Mr. Robert Lee and Mrs. Esme Brimblecombe. Florence Carter Skerritt had a first cousin, also called Florence Carter (born 1876), the daughter of Dorothy and George Henry’s youngest brother William Carter by William’s first wife, Ruth Outram of Grindleford Bridge (also the Carters’ distant cousin). The second Florence married William Henry Hall (born at Dove Holes, Dbysh, circa 1875), a stone quarry delver, and lived at Froggatt Edge. Best wishes, Glenn T.
It’s wonderful to hear from someone that is related however distantly ,you have given me a lot of information I had no idea about. Which spurs me on to do more searching . I did once have someone tell me that John skerritt was still alive in 1925 in Africa but have never been able to confirm that. Hello! I have only just found your website and am interested in your comments being a member of the Carter clan. My Grandfather was Sam Carter brother of the above mentioned Tom Carter. As a child in the 1950’s I visited John Skerritt who was living in Chichester, Sussex. I know a little of his life after the sad death of Florrie (nee Carter) and my mother and he communicated by letter when he was elderly. I think I may have a photo of him somewhere!